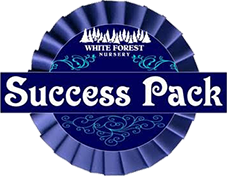 Success Pack Planting is a concept devoted to planting a certain way that gives you great performance from your plants and success in the garden. 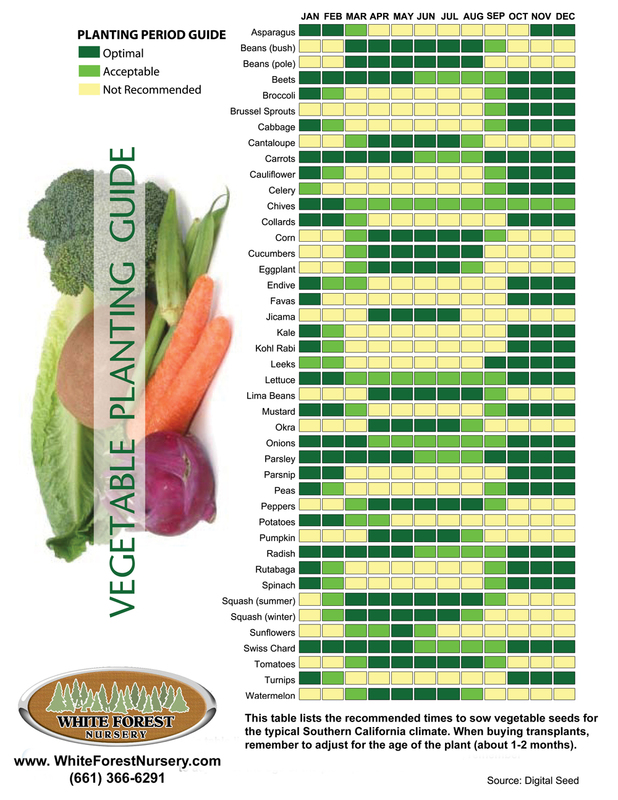 This method of planting was developed to make gardening simple, easy, and fun. Whether you are new to gardening or have been planting for years, use the Success Pack when planting for a garden your neighbors will be jealous of! 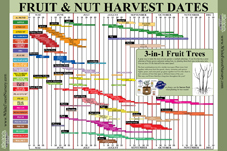 Get fruit faster! Cut your time to harvest in half. The following pictures are an example of using the Success Pack in high-density plantings. In this case, we planted 4 fruit trees in the same hole. This same method is easily used with a single planting or different varieties like roses, shade trees, or landscape accent shrubs. For more information about high-density plantings, check out our articles about 3-in-1 plantings HERE. Dig a hole 2x as wide and 2x as deep as the root system. Mix the dirt you dig out of the hole ½ & ½ with planting mix. Harvest Supreme is a great all-purpose planting mix. There are also specialized planting mixes like Rose & Flower Planting Mix and Acid Planting Mix. Make a bump at the bottom of your hole with your ½ & ½ mixture. Remove your plant from the pot and place in the hole on the bump so that the top of the rootball is 1-inch above the soil line. Backfill the hole about halfway and place 3 NutriPaks for smaller plants and 5 NutriPaks for larger plants evenly and flatly against the rootball. Do Not Open NutriPaks! NutriPaks last for 3 years. Backfill the rest of the hole and lightly tamp down the soil around your plants to get rid of any air pockets. 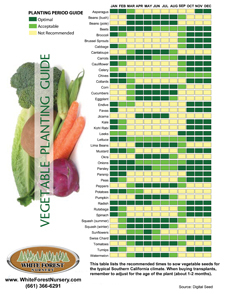 Treat your plants right with 100% organic plant food. 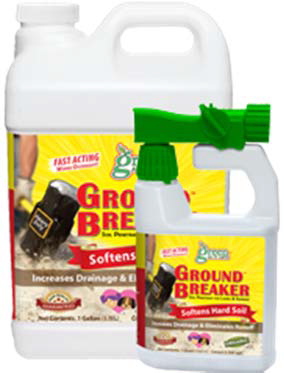 Spread fertilizer around plant and gently work into soil. Use 1 cup of fertilizer for 1-gallon plants and 2 cups of fertilizer for 5-gallon plants. A 4lb. bag will be enough to plant 8, 1-gal plants OR 4, 5-gal plants. Remember to feed your plants every 6-8 weeks during the growing season. This will give them the energy they need to keep growing! Simply spread a ¾-inch layer of GardenMax Soil Treatment around the base of your plant, being careful to keep away from your plants’ trunk. Give your new plants a good slow and deep watering. 1 bag of GardenMax Soil Treatment will plant 6, 1-gal plants and 3, 5-gal plants. It will cover approximately a 4-foot x 4-foot area. Works within hours to open up the pores of the soil to increase penetration to reduce standing water. Touted as the ‘turbo boost’ for GardenMax & TurfMax. Excellent to use when any planting instructions say “Water-in”. Thoroughly wet area before and after application. Turn and push-in sun shaped dial to turn GroundBreaker flow on. When ready to spray, turn water flow dial to the ON position. Apply evenly by spraying while walking at a steady pace. Now RELAX and be confident in a job well done. Now that you have taken the time to care for your plants, sit back and let them take care of you for years to come!